On January 5, 2018, Major Mustafa Abid was killed on duty while defusing a terrorist’s bombs on an Orthodox Church’s Christmas Eve in Egypt. It began when Sheikh Sayed Askar, a Muslim cleric, noticed what appeared to be a terrorist planting bombs on the roof of the Virgin Mary and Father Seifin Church in Nasr City, near Cairo. He notified authorities. The terrorist’s intentions were for the bombs to explode during the church’s Orthodox Christmas Eve service, scheduled for the following night where it was projected that hundreds of Christians would gather to worship. Persecution watchdog group International Christian Concern published a letter online, addressed to the family of Major Mustafa Abid. They are urging Christians from all over the world to join them in signing the letter, expressing thanks to the brave men who suffered serious injuries and to Mustafa Abid, who lost his life. By signing onto this letter, I wish to express my highest praise, deepest gratitude, and heartfelt sympathy for your injuries and loss incurred while following your conscience and your duty on Jan. 5, 2019. 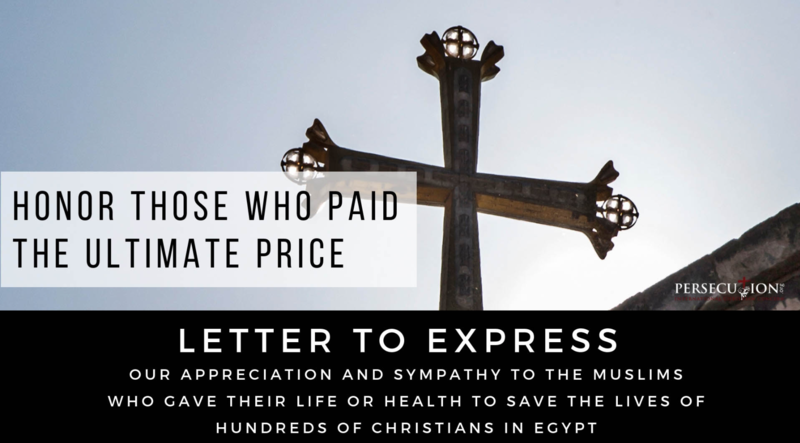 Your actions ensured that hundreds of Egyptian men, women, and children were not unjustly murdered during a deadly attack on the Virgin Mary and Father Seifin Church. I wish to thank the members of the bomb squad and various police officers who put themselves in danger for the sake of others. I pray for complete healing for all who were injured. I also join in mourning with the family of Major Mustafa Abid and express my heartfelt sorrow for your tragic loss. According to their press release, International Christian Concern expressed that “it’s rare that advocates for the persecuted Church have the opportunity to thank those who go against the status quo and risk their reputations, livelihoods and in this case their lives, to protect Christians. The actions of Major Abid, General Mansour, the other members of the Nasr City bomb squad, as well as Imam Askar, give us such an opportunity. Click here to sign the letter for yourself.